Our standard service area is a 70-90 mile radius from Lancaster and York, PA. If you require our expertise outside of this region please contact us to make arrangements. 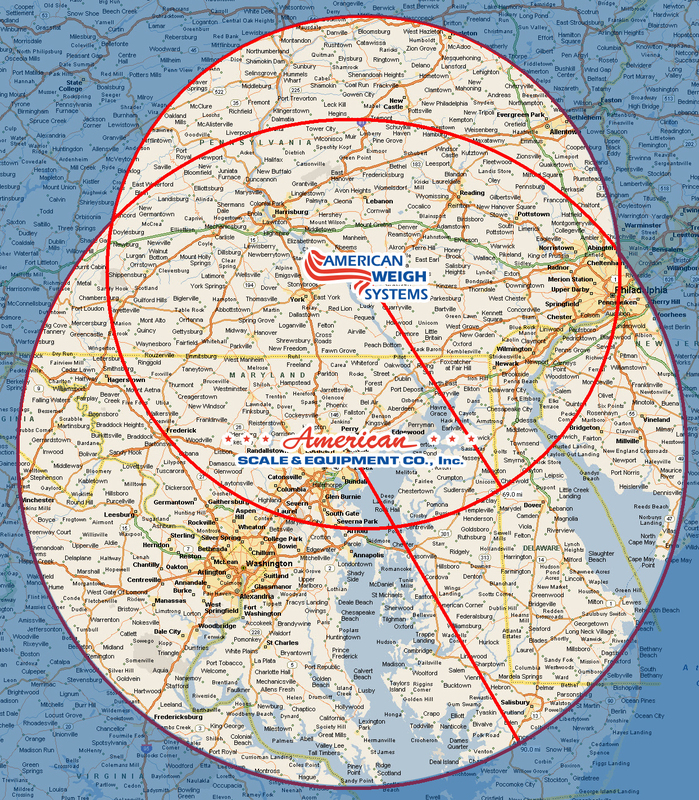 American Weigh Systems has been providing customers in the mid-Atlantic region with scale maintenance, repair, and calibration services for over 39 years. Our knowledge and experience equates to services that deliver responsive, comprehensive solutions to virtually any scale requirement. Maintaining the accuracy of scale systems is not only essential to quality control, it is critical in avoiding fines for conformity. Having a robust PM program for scales is the cornerstone of many quality programs. Scale accuracy is also a key factor in maintaining consistent output in modern manufacturing processes. You don’t have to be a lean manager to know what re-weighs will do to one piece flow. Having American Weigh as part of your quality audit will ensure consistent, precision operations, backed up by certificates of calibration and eventual online reporting. Our PMs and repair services include everything from the calibration and testing of load cells to stand replacement and concrete foundation repairs. Whether you need a complete overhaul, or a periodic maintenance contract, American Weigh Systems can accommodate the needs for any digital, hydraulic or analog scale up to 400,000 lbs. Services offered will be in accordance with NIST Handbook 44, NTEP certified, and compliant with NIST standard documentation for traceable weights. Augmenting these impressive capabilities is American Weigh's ability to provide consultation support. With so many years in the industry, we have a vast knowledge base to pull from. We can provide in-depth scale system analysis, and provide suggestions for upgrades, and process improvements that enhance scale utilization. We can source and acquire almost any scale system for virtually any application. To learn more about all of these capabilities and services, contact American Weigh Systems directly.